Oni Press have announced all the spicy details for the final installment of the recent run of holiday-themed BLUE MONDAY one-shots. Series creator Chynna Clugston-Major will team with the publisher to release NOBODY’S FOOL in February. The regular-sized comic will be broken into two stories, one for Saint Patrick’s Day and one for April Fool’s Day. In this month's edition of THE COMICS JOURNAL Audio Archive comics publisher Fantagraphics is paying a posthumous call on legendary EC Comics publisher WILLIAM GAINES. Gaines is reported to be one of publishers responsible for perhaps the first genuine renaissance in the comic book field, and later served as an inspiration for much of the underground comix movement. In these MP3s, the genial Mr. Gaines discusses horror comics, his testimony before the 1950s Senate Subcommittee hearings on "Comics and Juvenile Delinquency," the creation of the much-reviled Comics Code Authority, Harvey Kurtzman, MAD Magazine, and much more. Check them at http://www.tcj.com/listen/listen.html. 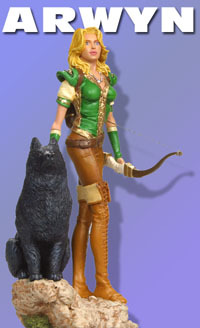 The beautiful archer Arwyn, and her faithful dog Kreeg, from the hit CrossGen Comics title Sojourn, has been brought to life in the first CrossGen statue by Dynamic Forces! Standing at 7 1/2" tall on a 4" wide base, the beautiful Arwyn has been modelled in meticulous detail in a high-quality, limited edition statue. The painting, done by Dan Lane, complements the CrossGen sculpts done by Vincenzo Cucca and Ciro Vignes as Arwyn stands surveying the countryside for the evil Mordath. An Ashleigh statue is also on the way. In April 2002, Oni Press published their first original graphic novel—DUMPED by Andi Watson. The bittersweet tale of relationships that rise and fall and the broken people caught on the waves of romance was an instant hit with comics readers, and continues to be one of Oni’s best back catalogue titles. Now, nearly a year later, Oni is looking to repeat that success with CHEAT, the first full-length work by writer/artist Christine Norrie (HOPELESS SAVAGES). From Sci Fi Wire comes the news that Francis Lawerence, who has directed video clips for prestigous groups and artists such as Aerosmith, Destiny's Child, Jennifer Lopez, Pink, Will Smith and Britney Spears, is in talks to make his feature directorial debut on Constantine, a film adaptation of the DC-Vertigo comic book Hellblazer, with no less than Matrix star Keanu Reeves in the title role. Reeves will star as John Constantine, a man who dabbles in the occult and teams with a female police officer to fight evil forces, the trade paper reported. Kevin Brodbin (The Glimmer Man) wrote the original script, with a rewrite by Mark Bomback and Frank Cappello. Unfortunately for Constantine fans, a draft of the script (which adapts Garth Ennis' famous "Dangerous Habits" story-line) has already received a critical review on TNMC.org. Follow the link above for the full, spoiler-packed review. Starting today, you'll be able to find some amazing full-colour desktop wallpapers, featuring all your favorite manga characters on ShonenJump.com! The high-quality images look good on any computer, and are a great way to show your interest in the world's most popular manga. This week, there are wallpapers for Dragonball Z, Yu-Gi-Oh!, Yu Yu Hakusho and One Piece. Check them out, and head back each week to see a new featured wallpaper, from now until the magazine launches in November! Code 6 Comics, a publishing arm of CrossGeneration Comics designed as an alternative for creators looking for a home for projects set outside of the CrossGen continuity, have announced they will be launching a new monthly comedy adventure series titled THE CROSSOVERS by veteran comics writer and novelist Robert Rodi and artist Mauricet in January 2003. The Crossovers is the second scheduled title from the new Code 6 line. THE CROSSOVERS is the first foray by Code 6 into satire and humor. It follows the December release of the fantasy series R.A. Salvatore's DemonWars. DC Comics have posted an exclusive interview with Jimmy Palmiotti and Justin Gray about their solid new sci-fi title THE RESISTANCE. "It is New York in 2280, where most of what we know of the city is underwater, while new skyscrapers tower above some 500 stories," said RESISTANCE scibe Justin Gray. "The city is in turmoil and a civil war is being kept under wraps by the media and government. Visually, you'll see that things have changed quite a bit in the last 200 plus years." Make sure you check out the full interview for a sneak-peak of some awesome RESISTANCE artwork by series penciller Juan Santacruz and inker Francis Portela. For more about THE RESISTANCE, point your browser to the mini-site. Madman Entertainment have just announced that they will be distributing anime magazine Newtype USA in Australia. Newtype USA is the official English-language version of Newtype, Japan's #1 source for information about anime and manga. Newtype USA includes all of the best Japanese content translated plus loads of original US material. Anime, manga, music, game, toy and model reviews, feature articles, director interviews, artist profiles, and regular columns by industry experts, tastemakers and deep-cover insiders. Every 300+ page issue of Newtype USA also includes free bonus gear: posters, a centerfold spread, postcards, a 16-page manga special and an exclusive DVD insert. The first issue is expected to be available mid to late October.